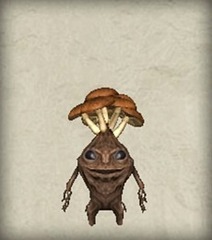 A Mandragora that has a growing cluster of infected mushrooms. The brown mushrooms on its cap are not only edible, they taste delicious and are inexpensive, which is why this subspecies is growing more popular. The challenge is keeping the growing mushrooms from being ruined by infection.